The CHIC project (see also HZwei issue from January 2014) was the first to employ fuel cell hybrid buses in small fleets in regular operation. The vehicles possess a battery or a supercapacitor that makes it possible to use the fuel cell at low output and make the ride more efficient, e.g., by through regenerative braking systems. The energy amount that can be stored from it is much smaller than the capacity of the hydrogen tanks. Models came from five different manufacturers. They were primarily smaller buses of 12 or 13.2 meters or around 39 to 43 feet in length – the latter with three axles – but there were also some articulated buses (18 meters or 59 feet). Their range was up to 400 kilometers (almost 249 miles) and they were used up to 20 hours a day. Most locations were subsidized by the Fuel Cells and Hydrogen Joint Undertaking (see figure). The project results have been documented and published as part of various reports evaluating different aspects of the project . These reports include recommendations for future projects, a study on the acceptance of fuel cell buses among public transportation users and a rating of their sustainability. Additionally, the project led to the establishment of a dialog with critics of hydrogen and fuel cell technology. All figures mentioned in the following are based on project progress at the end of June 2016. The buses were refueled around 61,750 times, which consumed more than 1,220 tons of hydrogen. It was possible to speed up refueling: Most of the time, it took fewer than 10 minutes to fill up a tank with on average 20 kilograms of hydrogen after one day of regular operation. The hydrogen filling stations had an average availability of 97 percent. The lowest value at a location was slightly above 94 percent and the best was at 99.8 percent. The target of the project was 98 percent at each location. These values are a considerable improvement over the ones of the previous project, HyFLEET:CUTE (see HZwei issue from January 2010), when mean availability was at 90 percent and the lowest value was 61 percent. As in previous projects, more than half of the downtime could be attributed to problems with the hydrogen compressors. Their impact varied throughout the cities taking part in CHIC: One location, which received its hydrogen supply in 500-bar high-pressure tanks from an external source, did not require a compressor and could avoid difficulties altogether. In other cities, there was downtime despite redundancies in place, meaning although two compressors were used at the same time. One reason was the contamination of hydrogen in the compressor and the subsequent components (partly even the bus tanks), which led to downtime for cleaning. The vehicles racked up more than 9.3 million kilometers or around 5.8 million miles. Their efficiency was notably greater than in the last generation, for example, because of the hybrid design. The 12-meter buses used 26 percent less energy than comparable diesel models. Whereas the 12-meter CHIC fuel cell buses required on average 9 kilograms of H2 on 100 kilometers or 62 miles (300 kWh/100 km), the vehicles employed during HyFLEET:CUTE had needed more than twice as much with around 18 kilograms. Mean availability was at about 70 percent, missing the 85 percent mark by a pretty wide margin. A variety of components caused difficulties during operation, but the fuel cell only played a minor part in it. Additionally, the on-site maintenance and repair crews had not always been sufficiently trained from the beginning and were not familiar enough with the properties of hybrid and fully electric vehicles. Another problem – which impacted all manufacturers – was the inadequate supply chain for spare parts. Overall, the vehicles and filling stations have successfully mastered the test stage. But if there was downtime, repairs took longer than expected, as replacement required special components for which demand has yet to pick up and which suppliers often have not in stock. A few examples are the DC-to-DC converters and the valves in buses, filling stations and compressor heads, and the H2 sensors. Sometimes, there was only one manufacturer available and this one was based outside Europe no less, which caused further delays because of customs checks, etc. All in all, the supply chains for essential components are still insufficient. As with vehicles and filling stations (without cars no filling station and without a filling station, no cars), the situation may lead to the proverbial chicken-and-egg dilemma: Long waiting times for spare parts will cause delays in introducing new technology to the market, and low demand means that production and availability will not pick up. A sustainability analysis has shown that the 12-meter fuel cell buses make it possible to reduce CO2 emissions by 85 percent compared to diesel units during their entire life cycle (manufacturing, operation incl. H2 generation / supply, maintenance and recycling). To achieve this degree of efficiency, it is essential that the hydrogen is generated entirely based on renewable sources. Studies estimate the direct life cycle costs of a fuel cell bus to remain above the ones for a comparable diesel version even in 2030 [2, 3]. However, the use of a diesel bus is associated with indirect health costs because of the emitted pollutants. Considering those, both vehicle types are at about the same cost per kilometer based on an estimate that was part of the sustainability analysis. The indirect costs, however, will be borne by all of society and not only by the bus company or its passengers. CHIC has shown the feasibility of fuel cell hybrid buses for transit services and the suitability of the current generation of hydrogen filling stations. The barriers to the commercial viability of vehicles and filling stations have been identified and measures are being taken to remove them. This offers the opportunity of zero-emission public transportation on the road. 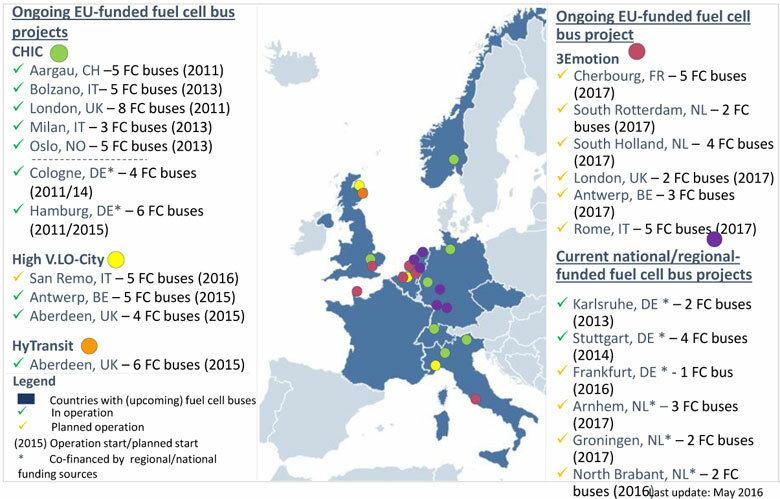 The CHIC buses are planned to remain in use during a new project called JIVE or “Joint Initiative for Hydrogen Vehicles across Europe” (see Diesel Exit – Global Advance of Electric Buses), which was launched in January 2017. Additionally, it will put more than100 new vehicles on the road, 50 of them in Germany. A joint purchase strategy of the bus companies is thought to contribute to decreasing the cost per vehicle further. A bid invitation for another project of similar size is expected in early 2017 too. The conference provided indications of how the future of the technology could again be not in Europe but in the east of Asia. A representative of Hyundai Motor Group unveiled 2020 plans to create a fleet of several hundred fuel cell buses in the region around Korea’s capital Seoul alone. In comparison, some attendees were rather disappointed by the sometimes very cautious fuel cell-related announcements that European manufacturers made. At least, there was the showcase of a fuel cell double-decker prototype in front of the event location, London’s City Hall. The project that ran from April 2010 through December 2016 and has led to the results presented in this article was supported with funds from the EU’s Seventh Framework Program (FP7/2007-2013) for the Fuel Cells and Hydrogen Joint Undertaking – grant agreement no. 256848.